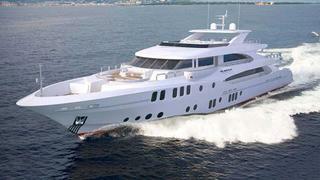 Gulf Craft CEO Erwin Bamps has reported to Boat International that its second Majesty Yachts 155 will soon be built. The UAE-based superyacht builder has told BI exclusively that they are starting the build soon on spec. Bamps said the build time for a Majesty 155 is two-and-a-half years. "We have been able to shave off delivery time by starting on spec and selling during build," says Bamps. "It's a calculated risk , but it has continued to pay off for us. We believe what we start we can finish and can find a client for it." The first Majesty 155 was sold after being started on spec and is well underway, to be launched in May 2015. The 47-metre semi-custom superyacht series is the builder's current flagship in its Majesty Yachts superyacht collection. The Majesty 155 in build will have twin 1,930-hp engines, taking her to a top speed of 16 knots and delivering a range of 4,200 nautical miles. The second hull of the Majesty 155 is still in the early stages of development with layouts being worked out, so it's too soon to say in what ways she might differ from hull No 1. Interior renderings are also being developed at this time. Stay tuned for more details.